Mozart, Wolfgang Amadeus, 1756-1791. Quartets, strings, K. 387, G major. Molto allegro . 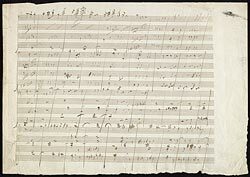 The end of the Finale of Mozart's String quartet in G, K. 387 : manuscript in the hand of Beethoven, 179-.